Living close to nature exposes our pets to potential risks, one of them being rabies. 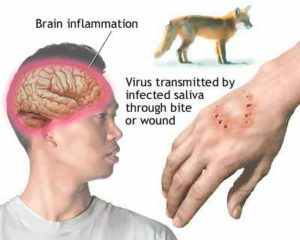 Rabies is a virus that is contracted through a bite from an infected animal. (Humans as well as pets can be infected.) Many species of wildlife can carry and be affected by the disease, becoming vicious, crazed, and acting against their normal nature. Fortunately for our pets, rabies is a preventable disease; we just need to ensure that they remain up to date on their vaccinations. Phase 1 (as the rabies virus takes hold): The animal exhibits fatigue, vomiting, fever, and may refrain from eating. Phase 2 (as the rabies virus changes behaviors): The animal displays heightened aggression, anxiety, and nervous tendencies. They may also seek solitude. Phase 3 (sometimes called the furious stage): The animal becomes intensely irritable. All of his senses are magnified making the animal hyper-active. The virus also blocks normal brain responses and leaves the gateway open for unnatural tendencies to occur. Once the virus takes hold of the brain the animal will start to salivate. It is at this point that the virus can be transmitted through a bite. Phase 4 (death from the virus): In animals that are not vaccinated the rabies virus generally kills its host. 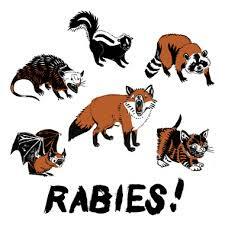 Rabies is a very serious virus, which is why it is important, for both you and your pets, to keep them vaccinated. Wild animals are beautiful creatures, but if you notice the symptoms of a rabid animal, call your local animal control immediately to help stop the spread of the disease. Dead animals should be removed promptly as well, as the rabies virus can live on the carcass of deceased animals long enough for scavengers to be affected by it. Due diligence can help prevent the spread of the rabies virus, and help keep both our pets and humans safe and healthy.